If you’re dreaming of those superb, retro locks on celebrities and stars, then you must be thinking of the vintage ‘40s waves hairstyle. They are making a comeback and will surely delight anyone who’s aiming for that perfect vintage era look. Take a peek at how you can get this done on your own or with the help of someone. Fortunately, vintage ‘40s waves are easy to do even at home. You don’t have to go to the salon for that superb style and avoid paying fees. There are things though you need to create the right look. But your biggest advantage is you can do as many retro styles you want emulating the 20s, 30s and 40s. And with enough practice, you can do it in no time for a blast in the past look. For the finger wave, damp hair is a must so you have to style your hair when it is about to dry. Other stylists also prefer to work on wet or nearly dry hair as it is easier to do the C-curls. As a first step, part your hair on the side using the comb. Go with the usual part you use for it will be difficult now to get a new hair part. Slather enough gel starting from the roots to the ends of the hair. Run the comb through the hair and make the first wave. When the ridge forms at the top of the head, keep it with two fingers or hold it with a clip. Do the next one and secure it as well. 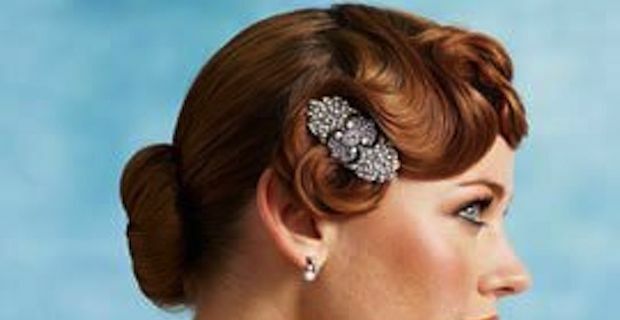 Once the waves are formed until ear level, do the pin curls with the rest of hair. Take the end of a rat tail comb and separate strands of hair. Wrap or curl it around your finger and secure with double prong clips. Once finished, put the hair under the dryer. Take off the clips and brush the hair once or twice. Use soft strokes. 1. Secure a section of the top hair with a clip. 2. Use serum to protect the strands from the heat of curling irons. 3. Take large sections and hold a 1-inch iron vertically and curl in one direction. Hot rollers are other curling options. 4. Work on the next section going in the same direction. 5. Squirt volumizing spray to retain shape. 6. Use a flat brush and comb. Note that highlighted hair does not really give the vintage look so go with your natural hair colouring whether it’s black, blonde, auburn or grey.